Fungie has not been much in the news recently as there is no longer any swimming going on with him to speak of. However he still likes boats, especially small inflatables and also sailing yachts such as the Folkboat in this photo. So we thought it was a good opportunity to reassure everyone that Fungie is as fit as ever, even though he must be well into his thirties by now. This is such a superb picture of Fungie that we thought it was worth offering you a larger size than normal, which you can see if you click here. 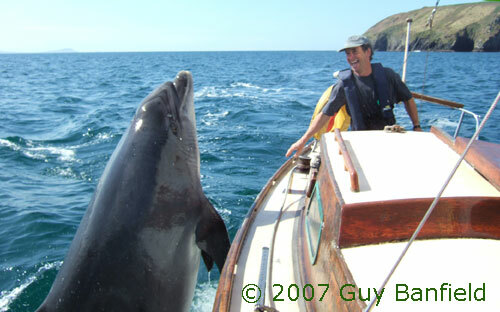 You can see how huge the dolphin is - half of him is still underwater as he launches himself up right next to the boat - but also how relaxed skipper Tim Clarke is. Tim is often out sailing in Dingle Bay so he has enjoyed being splashed by Fungie's jumps many times before, but there isn't usually a cameraman on board with quick enough reflexes to capture the moment - and a good enough sense of balance to produce a steady and well composed shot in the excitement of the instant. This time though, Guy Banfield was there at the ready, and his expertise as an aircraft pilot must have come in handy!